The aim of the Award is to recognise good design in developments in Ashton and the positive contribution they make to the quality of the built environment. 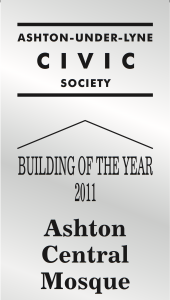 Ashton-under-Lyne Civic Society has named Ashton Central Mosque as its Building of the Year. The innovative design combines elements of traditional Islamic architecture with modern building materials and polychromatic brickwork featured in nearby buildings resulting in a building that sits sympathetically in its surroundings. The shallow dome and simple pointed minaret have a European flavour and are of a style that is commonly found in the Balkan states. The mosque and community centre buildings are linked by an atrium which provides an informal circulation space and facilitates the use of the community centre as an overflow for the mosque for large religious events. CLLR Peter Robinson, Tameside Council’s Executive Member for Transport and Development, said: “I think Ashton Civic Society has made a good choice. The new mosque is very impressive. A statement from the Trustees of Ashton Central Mosque said that the “design and construction of this new building has been a major logistical and financial undertaking for our community. We are immensely grateful to Tameside Council for their assistance. 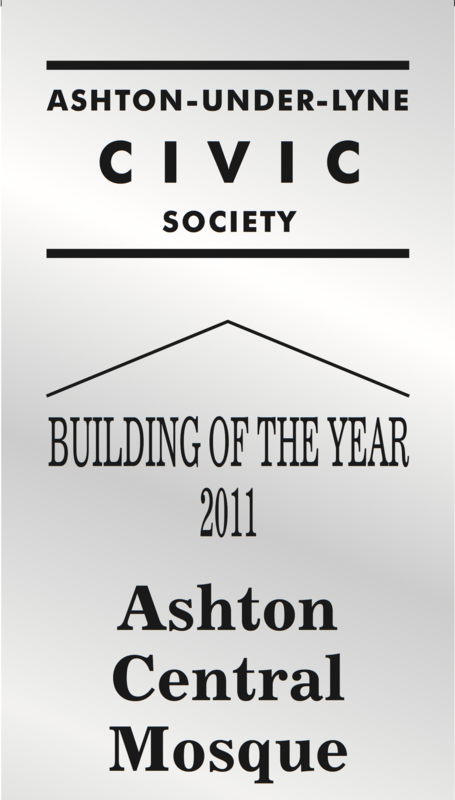 We are honoured to have received Ashton-under-Lyne Civic Society’s Building of the Year Award.